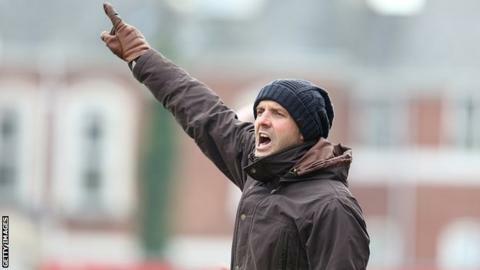 Exeter City manager Paul Tisdale says his patience has run out after four successive losses and changes to the side are inevitable. Saturday's 2-0 home loss to Southend United left the Grecians without a win in their last five games. "Sometimes we have to go through a dip in form to shake it up a bit," Tisdale told BBC Radio Devon. Exeter City are on a five-game winless run, losing the last four. The Grecians' last victory was 4-0 at Scunthorpe on 19 October. Since then they drew 0-0 with high-flyers Oxford, were beaten 1-0 at home by Burton, then 3-2 away to Portsmouth. They were knocked out of the FA Cup 2-0 at Peterborough before their latest 2-0 loss to Southend on Saturday. "It's time I look at things. I'm accountable for results, but players are responsible for their display." Exeter are now 10th in League Two but just two points off the play-off places and five below third. Tisdale added: "I'm not cross with them, I'm just being very honest with them and said that my job now is to step away from the group for two or three days to decide what we are going to do. "They need intensity and aggression, determination - all things you would expect really. "I've been very good, very respectful of the players and have kept a core group of eight or nine players together whatever. They play every game if they are fit, they have had a good run at it and now they have come off it." Tisdale handed trainee Matt Jay his Football League debut, and was impressed with the 17-year-old's impact having made just one senior substitute appearance in the Johnstone's Paint Trophy in September. And the Exeter boss will increasingly turn to youngsters at the club in an effort to find a solution to their form slump. "We can't go and make signings, that will not happen but we have players making strides within the squad and we have to look at those," Tisdale said. "We have a game Wednesday night in the under-21 cup and there are lots of players shining in that and I will look at them closely. "I made the decision to play Matt Jay and I thought he was wonderful. He was probably our best player in the first half and he got his selection on back of performances in training and under-21 games."